Willard Christopher Smith II (born September 25, 1968) is an African American actor and rapper. He is one of few people who has enjoyed success in the three major entertainment media in the United States: movies, television, and the music industry. Will Smith started his career as The Fresh Prince, the vocalist of the hip-hop duo DJ Jazzy Jeff & the Fresh Prince, which included childhood friend Jeffrey "DJ Jazzy Jeff" Townes as turntablist and producer. The duo was known for performing humorous, radio-friendly songs, most notably "Parents Just Don't Understand" and "Summertime". Smith was a charismatic and energetic performer, and in 1990, the NBC television network signed him up and built a sitcom, The Fresh Prince of Bel-Air, around him. The show was successful and ran for six seasons. Although he made a notable dramatic film debut in Six Degrees of Separation (in which he played totally against type as a gay con man) while still appearing in Fresh Prince, Smith's movie career took off with his role in Bad Boys (1995) along with co-star Martin Lawrence. 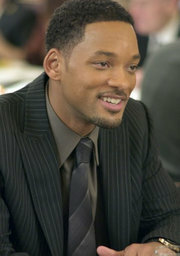 After Fresh Prince came to an end in 1996, Smith began a successful solo career in music and simultaneously starred in a series of movies. The first two films were hugely successful summer blockbusters: Independence Day (1996), where he plays a fearless and confident fighter pilot, and Men in Black (1997), where he plays the comic and confident Agent J against Tommy Lee Jones's deadpan Agent K. Smith's acting in Men in Black won critical praise, and both films established Smith's commercial reputation as a "bankable" star who had appeal across age, race, and gender, and could "open" a film at the box office. Smith also released a string of hit singles, often associated with his most recent movie, throughout the late 1990s. The most notable of these were his #1 hit theme song "Men in Black", the #1 hit "Gettin' Jiggy Wit It" (which made jiggy a catchphrase for a while in 1998), and "Just the Two of Us", an affecting message to his young son. His first two solo albums went platinum, but his third, on Columbia Records, was a sales disappointment compared to his past efforts, and after a quick Greatest Hits release that was almost not advertised at all, he was dropped by the label. He signed a recording contract with Interscope Records and released the so far, moderately successful Lost and Found in 2005.